In this era of Digital Reimagination™, the key to business success is to provide superior customer experience. However, with competition being just ‘one click away’, accelerated yet rich experience assumes greater importance. Dominance of mobile devices and platforms, necessitate organizations to deliver superior quality faster than competition in an evolving technological landscape. More so for the telecom industry where customer experience and retention are interconnected. In this joint webinar by Vodafone, Experitest and TCS, learn how to convert the mobile testing challenges into opportunities, by skillfully taking customer experience to whole new level. Like many other industries, Digital Reimagination™ has compelled life sciences organizations to transform. In the life sciences industry, boundaries are beginning to blur as ecosystems between products, patients, regulator and provider get re-defined, reshaping the industry into interconnected ecosystems. Life science organizations not only need to comply with current and newer regulations and legislations pertinent to the digital five forces, but also assure accelerated speed-to-market and personalized patient experience. This webinar will share insights on assuring a steady state system for life sciences organizations in the digital era. The Digital Reimagination™ era has had a dynamic impact on businesses, globally. While it has compelled some organizations to change the way they operate, it has also empowered some other organizations to taken a giant leap forward, thus beating competition. In such a scenario, Quality Assurance and Testing functions too need to keep pace with this new norm and reimagine themselves. This presentation will share insights on three pillars which will facilitate this reimagination Processes, Technology and People. This webinar will share insights on how organizations can effectively leverage the test automation lever to assure accelerated speed-to-market and optimize cost. In this era of Digital Reimagination™, organizations are continuously competing to launch new products or services faster. In such a scenario Quality Assurance and Testing function can provide a competitive edge and act as a catalyst for organizations to achieve this objective. The test automation lever can play a pivotal role in accelerating your testing timelines, which in turn can help you accelerate your speed to market. Join Quality Assurance and Testing experts from Rogers Communications and TCS to learn more about next-gen test automation and how it can help your organization accelerate time to market. Quality Assurance (QA) teams need effective assurance and testing strategies to make their dive into Big Data rewarding. Enterprises today are adopting mobile applications to stay competitive within the industry and relevant to their customers. Does your organization have a robust mobile application performance testing strategy to ensure high performance and scalable mobile applications? Organizations today embark on large transformational programs to address evolving business models, offer superior end customer experience and gain a competitive edge. You need a robust assurance strategy to achieve this successfully. Join Tata Consultancy Services (TCS) and RSA Scandinavia, as we share the winning formula to assure large transformational programs. Do Quality Assurance (QA) professionals have a major role to play in the DevOps era? Can continuous testing, integration, and delivery approaches, executed by a closely knit DevTestOps team help enterprises achieve faster time to market, and ensure rich customer experience? 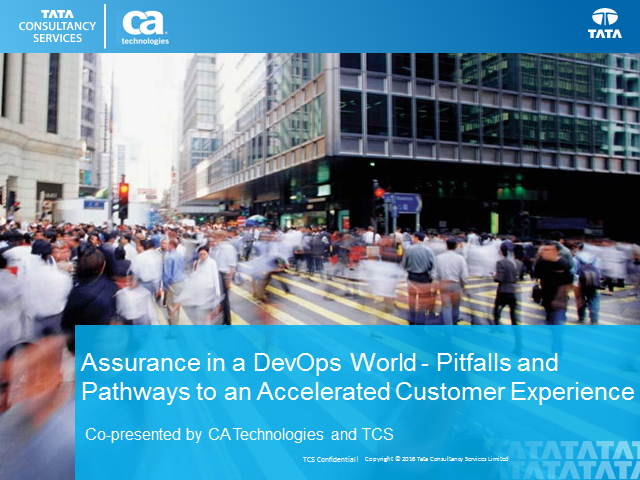 Join TCS and Nielsen, a leading global information and measurement company, as we discuss the role of assurance in DevOps, and how it can help you achieve your business and IT goals. Comcast, the world's largest mass media and communications company, faced TDM challenges including sub-setting referentially intact production data across applications in QA environment. Today, Comcast is able to manage data refresh and release cycle faster while ensuring regulatory compliant test data in test and training environments. All this was achieved with an innovative approach towards TDM. Join us in this webinar, hosted by Informatica and Tata Consultancy Services (TCS), to get insights into trends and drivers, and practical approach towards TDM. The webinar will emphasize on how speed, efficiency and accuracy through innovation can help organizations achieve real benefits. Most enterprises, irrespective of industry, are embarking on, or contemplating digital transformation programs. A critical success factor in this context, often overlooked, is an intelligent and cohesive digital assurance strategy. Real People. Real Assurance. Concrete Benefits. Tata Consultancy Services (TCS), together with its customers and domain experts, brings to you this webcast series featuring real scenarios, case studies and best practices for various types of testing such as mobility, SOA, ERP and customer experience. Join this community to gain valuable insights on critical aspects of assurance and benefits it can deliver.